The primary event of the second week is implantation. 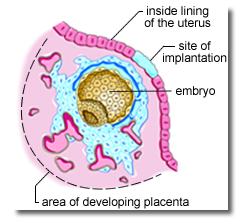 The attachment phase of implantation is briefly discussed in Unit 1. As implantation is underway, there is much activity inside and around the blastocyst. A structure called the yolk sac forms from the cells of the hypoblast.2 The yolk sac is a structure that provides nutrients from the mother to the embryo before the placenta is ready to function. 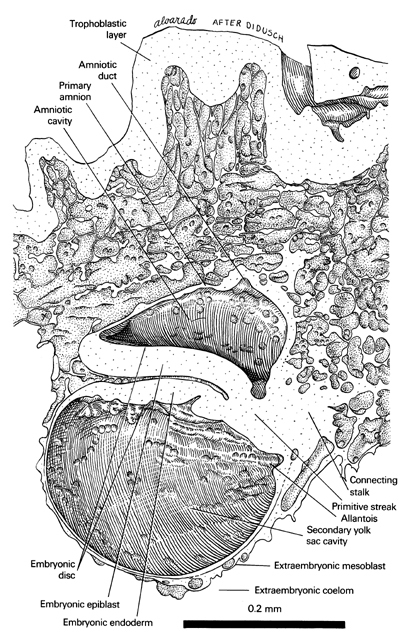 A membrane called the amnion forms from the epiblast. 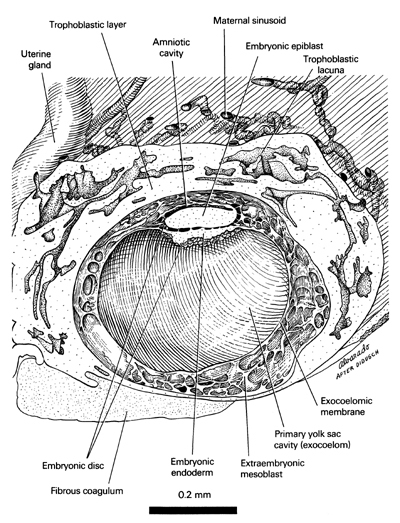 The epiblast also gives rise to the entire head and body of the embryo. HCG is commonly called the pregnancy hormone and its detection is the most frequent way of confirming pregnancy. Just 8 to 9 days after fertilization, doctors can establish pregnancy by finding hCG in a pregnant woman's blood and urine.1 Many different home pregnancy tests are available which check for hCG in a woman's urine. Because home pregnancy tests are not 100% accurate, seeing a doctor is always recommended when pregnancy is suspected. 1 F. Gary Cunningham, Paul C. MacDonald, Norman F. Grant, et al., Williams Obstetrics, 20th ed. (Stamford: Appleton and Lange, 1997), 26-29. From Gasser RF, 1975, 10. Atlas of Human Embryos. Copyright © 1975 RF Gasser, PhD. Once implantation is complete, the embryo continues to grow inside the wall of the uterus. It’s hard to believe, but development progresses so quickly that just 10 days after implantation is complete, the embryo’s heart begins to beat! Even before a woman is noticeably pregnant, her intake of food and beverage passes through the developing placenta and umbilical cord to nourish (or harm) the growing embryo. The use of harmful substances during pregnancy is doubly damaging because both the woman and embryo / fetus may suffer significant harm. Figure 2.3 - The Umbilical Cord & the 5½- Week Embryo. 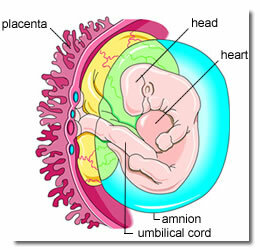 Once the placental circulation is in place; nutrients, oxygen, vitamins, and water in the mother’s blood stream pass through the placenta and umbilical cord to the embryo (and later the fetus); while carbon dioxide and other waste flows back to the mother.7 The placenta also produces hormones8 and maintains fetal temperature9 above the mother’s temperature - between approximately 100.7 to 102.5 degrees Fahrenheit or 38.2 to 39.2 degrees Celsius.10 A twisting cord of blood vessels, called the umbilical (um-bil’i-kal) cord, connects the embryo to the placenta.11 The best intensive care units found in modern hospitals hardly rival the placenta’s life-support capabilities. From Gasser RF, 1975, 12. Atlas of Human Embryos. Copyright © 1975 RF Gasser, PhD. 1 Moore and Persaud, 2003. 37. 2 Moore and Persaud, 2003. 50; O'Rahilly and Müller, 2001. 82. 3 Blackburn, 2003. 91; Chartier et al., 1979. 134; Cunningham FG et al., 2001. 27; O'Rahilly and Müller, 2001. 43. 4 Guyton and Hall, 2000. 948; Cunningham FG et al., 2001. 20. 5 Cunningham FG et al., 2001. 20, 26-27; O'Rahilly and Müller, 2001. 31. 6 Moore and Persaud, 2003. 120. 7 Cunningham FG et al., 2001. 86, 136; Cunningham FG et al., 2001. 96, 136; Hamilton and Boyd, 1960. 297-328; Harris and Ramsey, 1966. 43-58; Hertig, 1968. 16. 8 Garnica and Chan, 1996. 210-211; Liley, 1972. 101; O'Rahilly and Müller, 2001. 78-79. 12 Campbell et al., 1993. 765; Kurjak et al., 1994. 437; O'Rahilly and Müller, 2001. 82. 14 Moore and Persaud, 2003. 143.